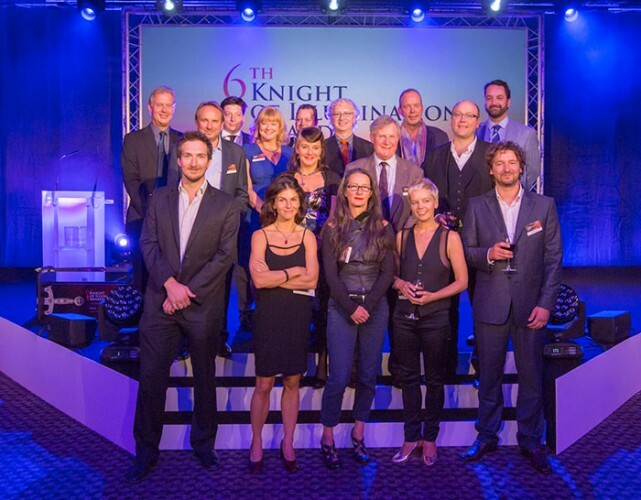 The sixth Knight of Illumination Awards (KOI), held on 6th October at London ExCel’s Platinum Suite, saw lighting and video professionals enjoy a glittering night of celebration and recognition for the exceptional creative talent within their industry. The ever popular awards - organised by The Society of Television & Lighting Design (STLD), The Association of Lighting Designers (ALD), Clay Paky and Ambersphere Solutions and generously sponsored by Chroma-Q, Hawthorn, MA Lighting, Osram, Robert Juliat and XL Video - provide public recognition for outstanding achievements in touring, television and theatre lighting and video design. Hosted by Andy Collins, the sparkling ceremony saw over 300 lighting and video professionals from the worlds of TV, Theatre, Concert Touring and Events come together to celebrate the diverse range of creative talent in production design today. First to be announced the Television Category with the Light Entertainment Award going to Gurdip Mahal and Ross Williams for The Voice Final. The Small Studio Award went to Colin Case for Howard Goodall’s History of Music; the Drama Award to Ashley Rowe BSC for Dancing on the Edge; the Event Award to Nick Collier for Bollywood Carmen Live and finally the new – introduced this year - Graphic Display Award went to Gurdip Mahal, Ross Williams and Dave Newton for The Voice. In the Theatre Category the Dance Award went to Fabiana Piccioli for iTMOi at Sadler’s Wells; the Musicals Award went to Paule Constable for Barnum at Chichester Festival Theatre Tent; the Opera Award went to Jean Kalman for Death in Venice at English National Opera; the Play Award went to Charles Balfour for The River at Theatre Upstairs, Royal Court and the new Projection Design Award went to Lysander Ashton for Feast at Young Vic. The dinner was rounded off with the Concert Touring and Events Category which saw the Arena Award go to Baz Halpin for Pink; The Stage Award go to Bruno Poet for Sigur Rós; the Live Event Award go to Patrick Woodroffe for London Olympics Ceremonies and the newly introduced Video Electronic Content Award go to Sarah Hopper and Damian Hale for Sigur Rós. As is tradition the evening was bought to a close by Clay Paky’s chief commercial officer, Pio Nahum who made the KOI charitable donation of £10,000 to Light Relief. This was closely followed by the prestigious Enrico Caironi Lifetime Recognition Award, which this year was presented to industry personality Ian Dow by international lighting designer – and KOI co-ordinator – Durham Marenghi. During his speech Marenghi said: "Ian Dow was a unanimous decision. The KOI committee feels he has worked and supported the lighting industry in very many ways. He was an engineering manager and lighting designer for the BBC for many years and has been the Chairman of Showlight for the last eight years. Ian has spent many hours training students and is particularly proud that Showlight offers 40 free places to students to help get them a foothold in the Industry." Each winner received the traditional Knight of Illumination trophy, an authentic medieval battle sword handmade in Toledo, Spain. The 2013 Knight of Illumination Awards was chaired by Stuart Gain for TV, David Benedict for the Theatre and Sarah Rushton-Read for the Concert Touring and Events Category. The event is kindly supported by: ABTT, etnow.com, L&S America, L&SI, PLASA, The Theatres Trust and TPi magazine. In picture: The winners and chairman of the KOI Awards.